My name is John Kempe and I'm the English Guy. 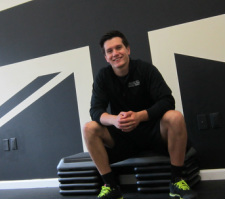 In early 2013 I left my Personal Training business that was based just outside of London and moved to New Jersey. Exercise is my way of life. It is my obsession and has been for almost 10 years. In school I was always an athlete, playing several competitive sports including basketball, track and field, and also a lot of rugby. But I remember always enjoying the training side of my sports more than the sport itself, so it was obvious to me that I wanted to coach others on how to be successful with their health and fitness. Back in England, I worked for two years with an elite gym company called Nuffield Health & Fitness, which had over sixty sites nationwide and a total of over six hundred personal trainers working for the company. Within six months of joining the Personal Training team I was ranked as the second highest trainer within the entire UK company for client satisfaction. So the people who came for my help always achieved their goals. Through knowledge and experience I coach effective and safe ways to lose excess weight and get toned. In addition, I give advanced strength training to athletes looking to increase power, strength and size. But I really specialize in getting anyone at any age or ability level, fitter than they ever thought possible. I have always worked with a wide variety of clients and every single one has been successful in working towards their final goal because I understand that everyone is different and that exercise programs need to be specifically tailored to suit the individual. Fitness and health should be a top priority in everyone’s life. Why keep struggling through tasks when they could be easy? You only get one heart. You only get one life. So work hard to take care of it, and it would be my pleasure to show you how.